This library file for 11 different wheelsets from 3ft 2ins diameter to 7ft 0ins, plus 6 different types of carrying wheels. You'll find that the driving wheels have either 'PB', 'PI' or 'BC' in the name, this describes the crankpin position relative to the spokes - either between (PB), inline (PI) or Bowen-Cooke (BC) which have a huge central boss unlike normal wheels. This area includes Blender files of common parts that can be used to speed up the creation of models for any Train Simulator. Instructions for using the library parts are included in the Blend file, in an embedded text file. 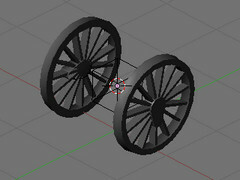 The wheelsets are animated and UV mapped ready to use. The files are supplied under the creative commons licence (Attribution) which basically means they may be freely used for any purpose providing I am credited.